I’ve bought a new diesel (Liliput zillertalbahn 4 wheeler + jackshaft) for testing purposes. It’s not the most powerful in the world and struggles with 4 WHR carriages up a gradient but it runs really well with lesser loads, was quite cheap (new at £50) and has a 6 pin DCC plug on board making switching from DC to DCC easy. I’m using this little red diesel to test the mods I’ve made to couplings and bogie pivots on a test track featuring 12 inch radius curves. The good news is that the mods have cured the problems on curves, but I am a little concerned that this has been achieved at the expense of a slightly too high ride height on the WHR carrs (FR are ok). Thus longer term I may look at alternatives to the 3mm scale plastic wheels that I have used up to now. For now they will be kept as is until there is time to switch them over (not a priority). I’ve also added weight to the WHHR ex Vale of Rheidol van which runs far better now too. 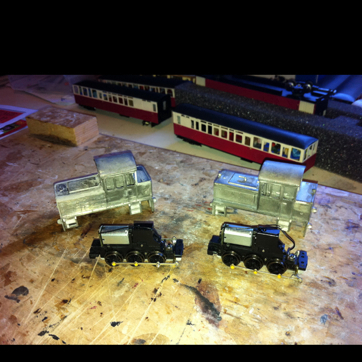 Here are the two finished chassis for harlech and criccieth castles. - drill the jackshaft pin holes out 1.6mm not the suggested 1.4mm. - suggest soldering the balance weights to the axles rather than using 603. It is stronger that way. - when laminating the balance weights use some wire to keep the holes in line. Might also be worth using 188 solder to avoid it coming apart when soldering to the axle. - be very careful when adding the slots into the new base plate - I suggest strengthening the area as it is pretty easy to snap the resin. - ensure you shorten the new axle to 19mm. - only add the new coupling rods once as otherwise you will loosen the Plastic holes and the tiny yellow crankpins will fall out. If this happens and you lose the yellow bit use one of the spare nickel washers and some brass wire to create a new pin and drill through the crankpin securing the new pin with superglue at the rear. I'm not totally convinced with the way the new axle sits in its slot but hopefully this will be ok, time will tell. 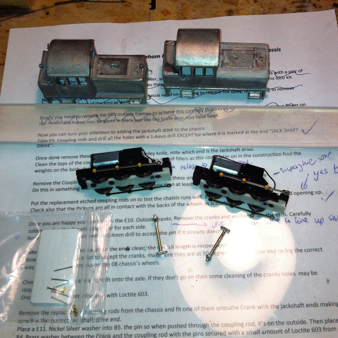 Tonight I started the conversion of two farish class 08 chassis to 0-6-0+jackshaft. These are for Harlech and criccieth castles. The conversion kit is from rt models. So far I have replaced the coupling rods after a bit of the usual reaming to get the holes just right. I've also replaced the keeper plates and soldered up the balance weights (triple laminations). The only tricky bit was soldering these balance weights to the 1.5mm diameter brass axle. I had to get them on square and quartered but also had to stop the balance weights from delaminating. Also the axle provided is too long by about 2mm so the excess will have to be cut away. After a few tries though these are on and are nearly perfect. Good enough I think. So the next stage is to install that axle after drilling a suitable hole through the chassis and then attaching the ends of the coupling rod to the balance weight with the help of some very small washers. When complete this will really improve the look of the Locos. Check out 'ohfourteen', my new blog about my micro O-14 layout plans. As some of you I’m sure will have worked out by now, Boston Largs Works are again involved with a project for Rhyd Ddu. This time it’s the other ballast wagon – the beast that is the Romanian new-build. The wagon is able to spread ballast between the rails as well as to the sides. I know how much effort when into initial alignment as track was laid as I did it myself a few times - avoiding the track moving before tamping was important and so being able to dump ballast all over the track prior to tamping helped considerably. At superpower I spent a long time taking shots of this wagon and it’s a complicated model. It’s coming along very nicely indeed as I’m sure you’ll agree. I have started the process of reviewing the coupling characteristics of all carriages. The first set of culprits were the FR saloons where the couplings did not protrude far enough past the end of the body (they were installed like this to get close prototypical coupling, but suffer from problems on the layouts tight curves). I also now have a functioning test track to test the new mark 2 longer couplings within rakes and avoid the problems seen at times at expong. The second challenge is to sort out the whr saloon bogie swing - the 3mm plastic axle mount is a great idea but needs some modification as on some carriages there is too much friction causing a lack of rotation for the bogies and consequent derailment problems i have some ideas to solve this and these will also be properly tested before being passed for service. Other projects aside, the plan is to sort the running issues on carriages and to add extra weight where required by the spring (2011) when work will recommence on extending the baseboards to cure the track alignment at the north end of the platform. I also hope to install a better backscene (with clouds) and new Anita decor trees. Then the winter (2011) will be spent on Locos. I might even make a start on Lyd (kit in store ready).